Since EF4 and Visual Studio 2010 you have been able to use T4 templates to generate code from models created using the EF Designer. Starting with EF5 and Visual Studio 2012 T4 based code generation is the default for new models created using the EF Designer. 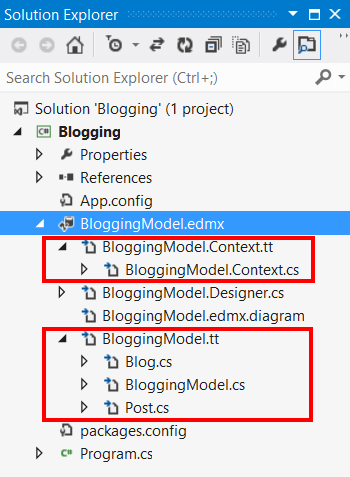 When you create a new model using VS2012 or later you get two T4 templates (.tt files) nested under you EDMX file – one to generate the context and another to generate the entity classes. If you have opted in to T4 based code generation in VS2010 then you’ll have the same setup but the T4 templates won’t be nested under the EDMX. Expanding the T4 template will show the files that is is generating. Whenever you save changes to your model in the EF Designer, the templates will re-run and update the generated code. But what if you want to run code generation outside of Visual Studio? <%%KEEPWHITESPACE%%>    -I "%ProgramFiles(x86)%\Microsoft Visual Studio 11.0\Common7\IDE\Extensions\Microsoft\Entity Framework Tools\Templates\Includes"
PrimaryOutputCodeFile – The name of the file that the template should write code to. EF always uses the template file name replacing .tt with the extension for the language (.cs for C# or .vb for VB.NET). You’ll notice the entity template will also generate additional code files – one for each entity. NamespaceForGeneratedCode – The namespace to use for generated classes. T4TemplateToProcess – The template that you want to generate code from. -dp T4VSHost!Microsoft.Data.Entity.Design.VisualStudio.Directives.FallbackT4VSHostProcessor! "%ProgramFiles(x86)%\Microsoft Visual Studio 11.0\Common7\IDE\Microsoft.Data.Entity.Design.dll"
<%%KEEPWHITESPACE%%>    -dp T4VSHost!Microsoft.Data.Entity.Design.VisualStudio.Directives.FallbackT4VSHostProcessor! "%ProgramFiles(x86)%\Microsoft Visual Studio 11.0\Common7\IDE\Microsoft.Data.Entity.Design.dll"